Expect more buzzing this week! 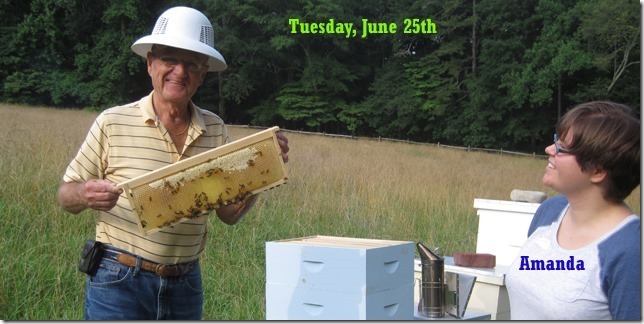 This week we begin again our Journey with beekeeping. We will be keeping bees as a family this time and will have two hives. We have new challenges, a new look, a great support team, and pictures soon. Here is a pic T.J. took of our backyard. Here are some friends who, like me, were inspired by bees at the Creative Discovery Museum. I used to stare at the observation hives fascinated by the work of the bees. These girls went with their family to a Honey Harvest Event at the museum and soon wanted to learn more. I think we both enjoyed our mentoring class. 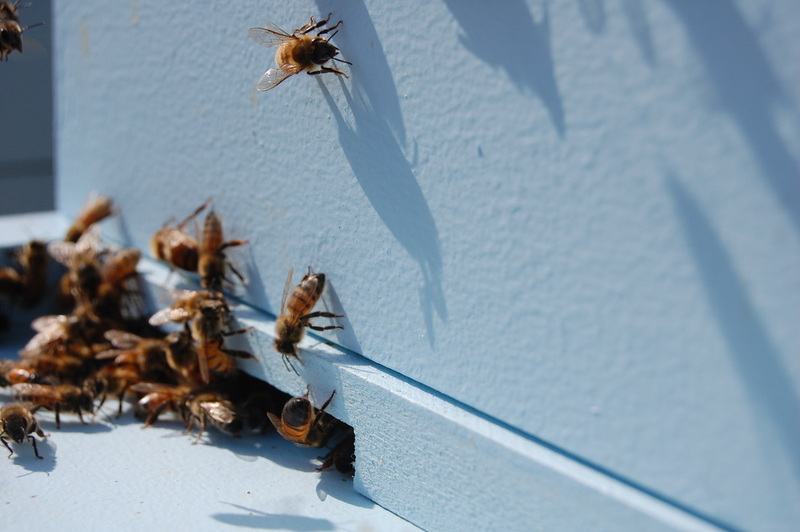 Here is a photo from last March installing our bees. Below is a link to an article from the Creative Discovery Museum's Blog. It has been a while since these photos were taken, but I still wanted to share them. This was the day I took my Grandfather-in-law, Gramps, to visit my hive. This was the same day I noticed a piping noise and began to wonder what my Queen was up to. Virgin queens make a special noise called piping when they are trying to fight off another queen. Check out the video to learn more and hear what piping sounds like. I "Never did this before!" 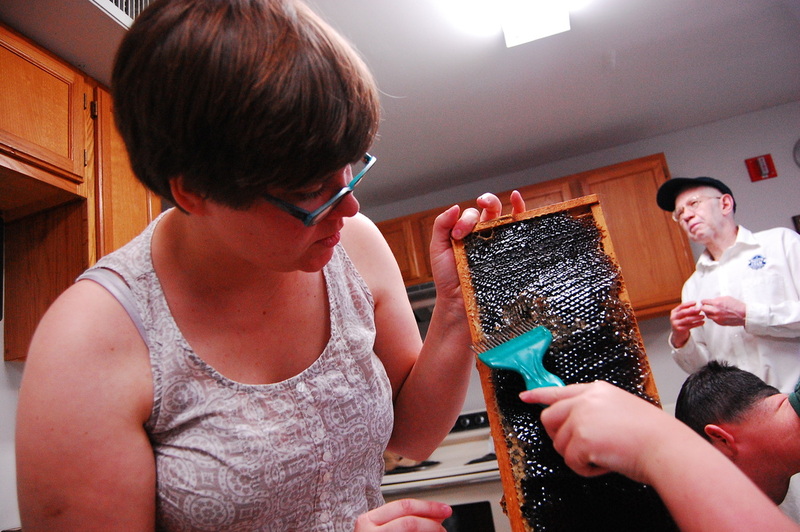 The "first thing to learn is to be a little gentle" I had "good results—no stings!" As a new beekeeper I am keeping track of my stings. I want to make sure my reactions to stings are normal and don't get worse. I have a localized reaction, which means I swell up right around the place I got stung. My face looked a little funny and swollen for a few days, but then returned to normal. It seems like all of my sting reactions are the same. It hurts for the first minute and then the pain is gone and no swelling. The next day it starts swelling. It stops swelling a day later and then starts going back to normal. Every sting is different and so far every sting comes in a different part of my body. Being stung is never fun, but if I can learn what I did wrong, then I can take better care of myself and my bees. 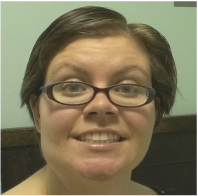 A few days after I was stung on my jaw, the shape of my face changes. Absconding Swarm- an entire colony of bees that abandons the hive because of disease, wax moth, or other maladies. Apiary- colonies, hives, and other equipment assembled in one location for beekeeping operations: bee yard. Automatic uncapper-automated device that removes the cappings from honeycombs, usually by moving heated knives, metal teeth,or flails. Bee Blower- an engine with attached blower used to dislodge bees from combs ina honey superby creating a high-velocity, high volume wind. Bee escape- a device used to remove bees from honey supers and buildings by permitting bees to pass one way but preventing their return. Beeswax- a complex mixture of organic compounds secreted by special glands on the last four visible segments on the ventral side of the worker bee’s abdomen and used for building comb. It’s melting point is from 143.6 to 147.2 degrees F.
Bee veil-a cloth or wire netting for protecting the beekeepers head and neck from stings. Braula coeca- the scientific name of a wingless fly commonly known as the bee louse. Buff comb- a bit of wax built upon a comb or upon a wooden part in a hive but not connected to any other part. Capped brood – pupae whose cells have been sealed with a porous cover by mature bees to isolate them during their nonfeeding pupal period; also called sealed brood. Capping melter – melter used to liquefy the wax from cappings as they are removed from hone combs. Cappings – the thin wax covering of cells full of honey; the cell coverings after they are sliced from the surface of a honey-filled comb. Castes – the three type of bees that comprise the adults population of a honey bee colony:workers, drones, and queen. Cell – the hexagonal compartment of a honey comb. 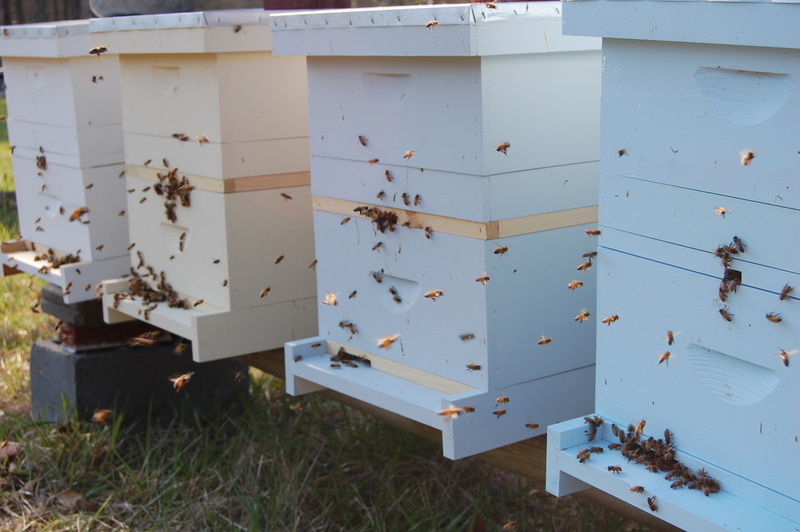 Cell bar – a wooden strip on which queen cups are placed for rearing queen bees. 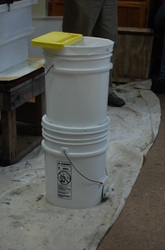 Cell cup – base of an artificial queen cell, made of beeswax or plastic and used for rearing queen bees. Chilled brood – immature bees that have died from exposure to cold; commonly caused by mismanagement. Chunk honey – honey cut from frames and placed in jars along with liquid honey. Clarifying – removing visible foreign material from honey or wax to increase it purity. Cluster – a large group of bees hanging together, one upon another. 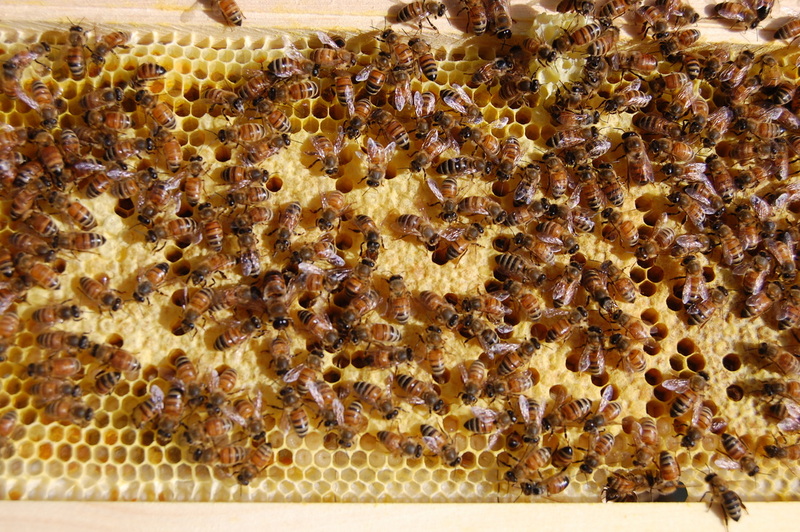 Comb – a mass of six-sided cells made by honey bees in which brood is reared and honey and pollen are stored; composed of two layers united at their bases. Comb foundation – a commercially made structure consisting of thin sheets of beeswax with the cell bases of worker cells embossed on both sides in the same manner as they are produced naturally by honey bees. Comb honey – honey produced and sold in the comb, in either thin wooden sections (4 x 4 inches or 4 x 5 inches) or circular plastic frames. Creamed honey – honey which has been allowed to crystallize, usually under controlled conditions, to produce a tiny crystal. Crimp-wired foundation – comb foundation into which crimp wire is embedded vertically during foundation manufacture. Cross-pollination – the transfer of pollen from an anther of one plant to the stigma of a different plant of the same species. Decoy hive – a hive placed to attract stray swarms. Demaree – the method of swarm control that separates the queen from most of the brood withing the same hive. Dextrose – one of the two principal sugars found in honey; forms crystals during granulation.Also known as glucose. Dividing – separating a colony to form two to more units. Division board feeder – a wooden or plastic compartment which is hung in a hive like a frame and contains sugar syrup to feed bees. Double screen – a wooden frame, ½ to ¾ inch thick, with two layers of wire screen to separate two colonies within the same hive, one above the other.An entrance is cut on the upper side and placed to the rear of the hive for the upper colony. 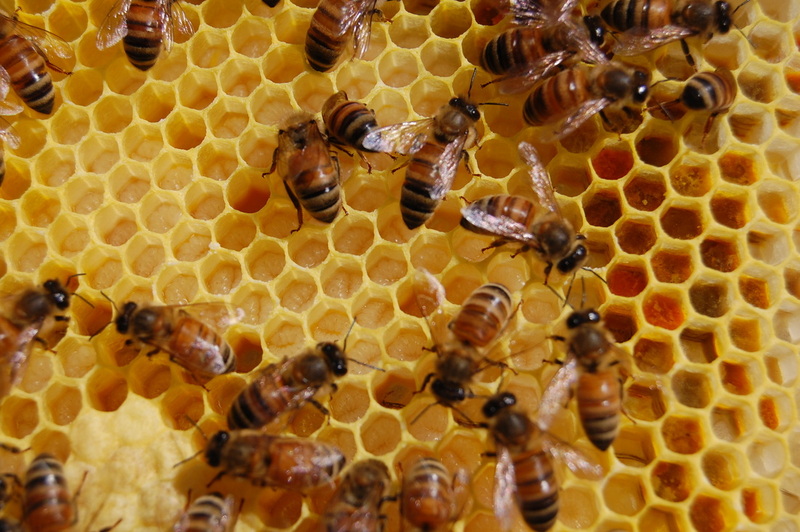 Drawn combs – combs with cells built out by honey bees from a sheet of foundation. Drone – the male honey bee. Drone comb – comb measuring about four cells per linear inch that is used for drone rearing and honey storage. Drone layer – an infertile or unmated laying queen. Drumming – pounding on the sides of a hive to make the bees ascent into another hive placed over it. Dwindling – the rapid dying off of old bees in the spring; sometimes called spring dwindling or disappearing disease. Dysentery – an abnormal condition of adult bees characterized by severe diarrhea and usually caused by starvation, low-quality food, moist surrounds, or nosema infection. Electric embedder – a device allowing rapid embedding of wires in foundation with electrically produced heat. European foulbrood – an infectious brood disease of honey bees caused by streptococcus p/u ton. 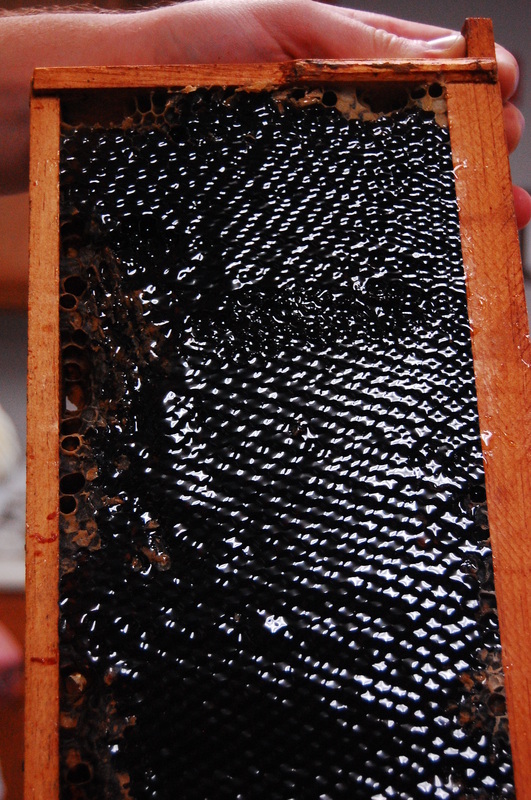 Extracted honey – honey removed from the comb by centrifugal force. Fermentation – a chemical breakdown of honey, caused by sugar-tolerant yeast and associated with honey having a high moisture content. Fertile queen – a queen, inseminated instrumentally or mated with a drone, which can lay fertilized eggs. Field bees – worker bees at least three weeks old that work in the field to collect nectar, pollen, water andpropolis. Flash heater – a device for heating honey very rapidly to prevent it from being damaged by sustained periods of high temperature. Follower board – a thin board used in place of a frame usually when there are fewer than normal number of frames in a hive. Food chamber –a hive body filled with honey for winter stores. Frame – four pieces of wood designed to hold honey comb, consisting of a top bar, a bottom bar and two end bars. Fructose – the predominant simple sugar found in honey; also know as levulose. Fumidil-B – the trade name for Fumagillin, an antibiotic used in the preventions and suppression of nosema disease. Fume board- a rectangular frame, the size of a super, covered with an absorbent material such as burlap, on which is placed a chemical repellent to drive the bees out of supers for honey removal. Groafting – removing a worker larva fromits cell and placing it in an artificial queen cup in order to have it reared into a queen. Grafting tool – a needle or probe used for transferring larvae in grafting of queen cells. Granulation – the formation of sugar (dextrose) crystals in honey. Hive – a man-made home for bees. Hive body – a wooden box which encloses the frames. Hive stand – a structure that supports the hive. 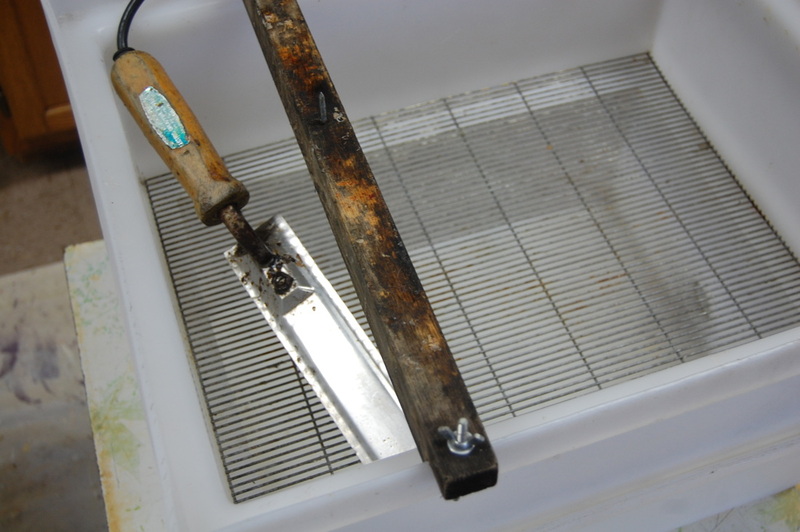 Hive tool – a metal device used to open hives, pry frames apart and scrape wax and propolis from the hive parts. Honey – a sweet viscid material produced by bees from the nectar of flowers, composed largely of a mixture of dextrose and levulose dissolved in about 17 percent water; contains small amounts of sucrose, mineral matter, vitamins proteins, and enzymes. Honeydew – a sweet liquid excreted by aphids, leaflioppers and some scale insects that is collected by bees, especially in the absence of a good source of nectar. Honey extractor – a machine which removes honey from the cells of comb by centrifugal force. 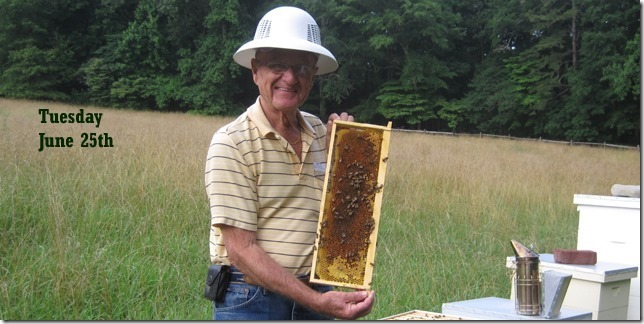 Honey flow – a time when nectar is plentiful and bees produce and store surplus honey. 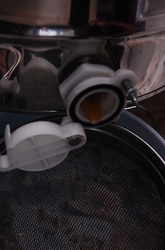 Honey gate – a faucet used for drawing honey from drums, cans, or extractors. Honey stomach – on organ in the abdomen of the honey bee used for carrying nectar, honey or water. Honey sump – a clarifying tank between the extractor and honey pump for removing the coarser particles of comb introduced during extraction. Increase – to add to the number of colonies, usually by dividing those on hand. Instrumental insemination – the introduction of drone spermatozoa into the genital organs of a virgin queen by means of instruments. Invertase – an enzyme produced by the honey bee which helps to transform sucrose to dextrose and levulose. Larva (plulral, larvae) – the second stage of bee metamorphosis; a white, legless, grub like insect. Laying worker – a worker which lays infertile eggs, producing only drones, usually incolonies that are hopelessly queen less. Mathing flight – the flight taken by a virgin queen while she mates in the air with several drones. Migratory beekeeping – the moving of colonies of bees from one locality to another during a single season to take advantage of tow of more honey flows. Nectar – a sweet liquid secreted by the nectarines of plants; the raw product of honey. Nectaries- the organs of plants which secrete nectar, located within the flower (floral nectarines) or on other portions of the plant (extrafloral nectarines). Nosema – a disease of the adult honey bee caused by the protozoan Nosema apis. Nurse bees – young bees, three to ten days old, which feed and take care of developing brood. Observation hive – a hive made largely of glass or clear plastic to permit observation of bees at work. Out-apiary – an apiary situated away from the home of the beekeeper. Package bees – a quantity of adult bees (2 to 5 pounds), with or without a queen, contained in a screened shipping cage. Paralysis – a virus disease of adult bees which affects their ability to use legs or wings normally. Parthenogensis – the development of young from unfertilized eggs.In honey bees the un-fertilized eggs produce drones. PDB (Paradichlorobenzene) crystals used to fumigate combs against wax moth. Piping – a series of sounds made by a queen, frequently before she emerges from her cell. Pollen – the male reproductive cell bodies produced by anthers of flowers, collected and used by honey bees as their source of protein. Pollen basket – a flattened depression surrounded by curved spines or hairs, located on the outer surface of the bee’s hind legs and adapted for carrying pollen gathered from flowers or proplis to the hive. Pollen cakes - moist mixtures of either pollen supplements or substitutes fed to the bees in early spring to stimulate brood rearing. Pollen insert – a; device inserted in the entrance of a colony into which hand collected pollen is placed.As the bees leave the hive and pass through the trap, some of the pollen adheres to their bodies and is carried to the blossom, resulting in cross-pollination. Pollen substitute – any material such as soybean flour, powdered skim milk, brewer’s yeast, or a mixture of these used in place of pollen to stimulate brood rearing. Pollen trap – a device for removing pollen loads from the pollen baskets of incoming bees. Pollination – the transfer of pollen from the anthers to the stigma of flowers. Pollinator – the agent that transfers pollen from an anther to a stigma; bees, flies, beetles, etc. Prime swarm – the first swarm to leave the parent colony, usually with the old queen. Proboscis – the mouthparts of the bee that form the sucking tube or tongue. Pupa – the third stage in the development of the honey bee, during which the organs or the larva are replaced by those hat will be used by an adult. Queen – a fully developed female bee, larger and longer than a worker bee. Queen cage – a small cage in which a queen and three or four worker bees may be confined for shipping and or introduction into a colony. Queen cell – a special elongated cell, resembling a peanut shell, in which the queen is reared.It is usually an inch or more long, has an inside diameter of about ½ inch, and hangs down from the comb in a vertical position. Queen clipping –re moving a portion of one or both front wings of a queen to prevent her from flying. 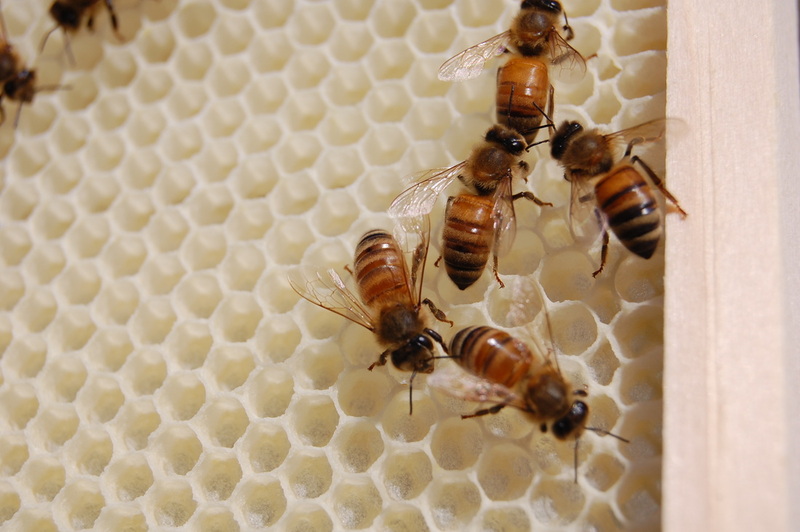 Queen cup – a cup-shaped cell made of beeswax for plastic which hangs vertically in a hive and which may become a queen cell if an egg or larva is placed in it and bees add wax to it. Queen excluder – metal or plastic device with spaces that permit the passage of workers but restrict the movement of drones and queens to a specific part of the hive. Queen substance – pheromone material secreted from glands in the queen bee and transmitted throughout the colony by workers to alert other workers of the queen’s presence. Rabbet – a narrow piece of folded metal fastened to the inside upper end of the hive body form which the frames are suspended. Rendering wax – the process of melting combs and cappings and removing refuse form the wax. Resmethrin (SBP-1382) – a synthetic pyrethroid insecticide used to kill diseased honey bee colonies. Robbing – stealing of nectar, or honey, by bees from other colonies. Royal jelly – a highly nutritious glandular secretion of young bees, used to feed the queen and young brood. Sacbrood – a brood disease of honey bees caused by a virus. Scout bees – worker bees searching for a new source of pollen, nectar, propolis, water, or a new home for a swarm of bees. Self-pollination – the transfer of pollen from anther to stigma of the same plant. Self-spacing frames – frames constructed so that they are a bee space apart when pushed together in a hive body. Spermatheca- a special organ of the queen in which the sperm of the drone is stored. Spur embedder- a device used for mechanically embedding wires into foundation by employing hand pressure. Sting- the modified ovipositor of a honey bee used as a weapon of defense. Supersedure-a natural replacement of an established queen by a daughter in the same hive. Shortly after the young queen commences to lay eggs, the old queen disappears. 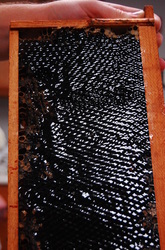 Travel stain- the dark discoloration on the surface of comb honey left on the hive for some time, caused by bees tracking propolis over the surface. T-super-a comb honey super with t-shaped strips supporting the sections to provide more space for bee travel. Venom Allergy-a condition in which a person, when stung, may experience a variety of symptoms ranging from a mild rash or itchiness to anaphylactic shock.A person who is stung and experiences abnormal symptoms should consult a physician before working bees again. Venom hypersensitivity- a condition in which a person, if stung, is likely to experience an aphylactic shock.Apersonwith this condition should carry an emergency insect sting kit at all times during warm weather. Wax glands- the eight glands that secrete bees wax; located in pairs on the last four visible ventral abdominal segments. Winter cluster-the arrangement of adult bees within the hive during winter. Worker bee-a female bee whose reproductive organs are undeveloped.Worker bees do all the work in the colony except for laying fertile eggs. Why are these Bees Targeting my Hair? The other day a bee got stuck in my hair. I wasn't super close to the hive so I had taken off my veil. Now when I say the bee was stuck, I mean it. The poor little insect couldn't find its way out. I tried to help her out, but she was trapped and being attacked by my hair. The little bee did not like that and that is why I got stung. Luckily my friend was nearby to help me get the stinger out of my face. That sting nailed me right on the jaw and for a moment it hurt. So just like any other day I am getting ready to start working with my bees and as I am putting my veil on, a bee flies into my hair. I am trying once again to save a bee from my attacking hair, thinking that I am bound to be stung again. Then it happens on the top of my head. Again, I had a friend nearby to help me remove the stinger out of my hair. He mentioned that bees don't like perfume or smelly shampoos. I told him I use a natural shampoo made of tea tree. He smiled and told me that was my problem. Tea Tree oil may be good for your scalp, but not if your a beekeeper. Bees are attracted to the smell. That explained why the bees were targeting my hair. I have learned my lesson if you don't want bees in your hair stop luring them there. Oh, I also changed shampoo. How do Bees Organize their Hive? Running a hive takes a lot of work. Just like humans, bees will work together to get their job done. Here are a couple of things that help keep them organized. Storage- Bees also organize their home. they keep some honey and pollen near the babies who need it most, and extra honey is stored for later in another part of the hive. All of the brood or babies live together in the same part of the hive. Chores- I know that organizing a home is a job for the whole family and it helps when we have our own responsibilities or chores. At my house it is my job to cook and get groceries and my husband maintains and fixes the house. Bees also have different chores or jobs for different family members. Communication- To keep our days running smoothly my husband and I communicate about things we want to do and our goals. Bees also use their own language to help their sisters find what they need. Here are some photos of comb with different things stored in its cells. Can you see how the pollen is separated from the larva and capped brood. Each thing has it's own place. workers have many jobs throughout their lives, they clean, care for the brood, build comb, guard the hive, and forage. Bees have their own language that is very different from our own. They dance to tell others where nectar and pollen are, how much there is, and if it is high quality. Here is a short clip about the waggle dance. This bee is using it to tell others where a new home could be, but bees also use this dance to tell others where to get nectar. Watch The Waggle Dance on PBS. See more from NOVA scienceNOW. 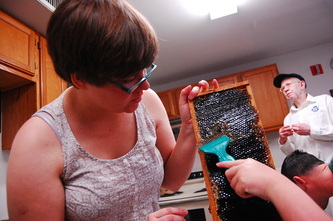 Occasionally you may see photos of me working with my bees without safety gear. 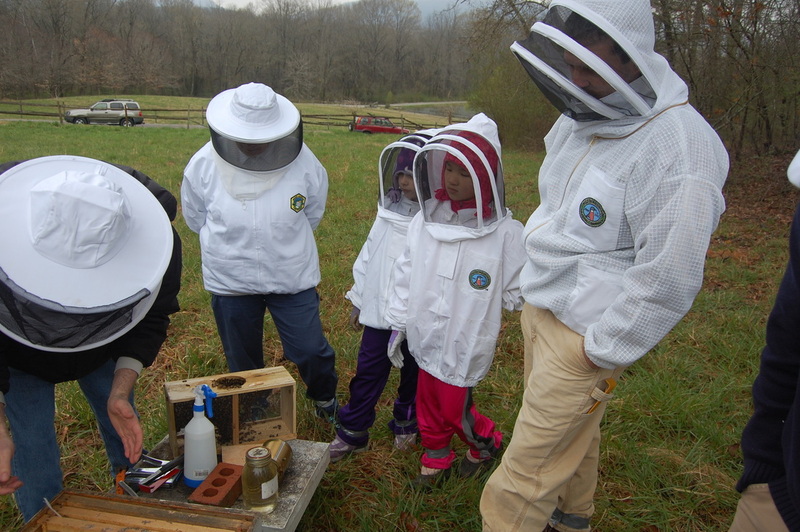 Most beekeepers wear a veil and jacket to keep from getting stung. But I believe the best thing to keep you safe is knowing what to expect. The best thing to keep you safe is knowing what to expect. Know your bees. Are they aggressive (and may charge you) or calm? Africanized bees are known to charge from more than 20 feet away some beekeepers need to be dressed in their gear before they arrive to the bee yard. Think about the weather or season. If it has been rainy for the past week they may be temperamental. Will you be working with a small hive or a larger hive. 10,000 bees may seem like a lot, but 80,000 bees flying around your head may mean you need to wear a full suit (veil, jacket, long pants, and gloves). Are you doing a short check (looking at the top most frames) or are you checking all the frames? If you are just lifting the roof you may not need to smoke your bees as much as a full hive check. Sometimes you will get stung. You might hurt a bee when you set down a frame or push them a little to far. It happens. As a beekeeper you must expect that you will get stung. Some beekeepers are allergic to bee stings and must carry an Epi-Pen (a shot that goes into your leg) to prevent them from having a dangerous allergic reaction. Other beekeepers bring topical antihistamines to calm any swelling. Other may need to take medication to stop a mild allergic reaction. It is important to know how you react to a bee sting to keep yourself safe. The more you know about what to expect the better prepared you can bee to work with bees. I know that some days I am fine without gloves and a Jacket but there may be other days that I need them. I am not more brave than my beekeeper friends wearing full suits, but I do think that this year I have been blessed with a calmer colony of bees. I am always prepared and have water, gloves, a jacket, veil and allergy medication on hand just in case. Yesterday I was walking back to my car after working with the bees and one got stuck in my hair. I tried my best to help her out while staying calm, but I got stung anyway. I am sure if I got lost in a head of hair I would be scared, frustrated, and ready to sting whatever was trapping me. I am not mad, but a little sad for that little stuck bee. As soon as I was stung, a friend helped me pull the stinger out. Because it was pulled out so fast, It wasn't as painful as my last sting. After emerging from their capped cell they get some pollen to eat then get to work cleaning their room, I mean cell. They also work to keep the brood warm. You can see lots of capped brood almost ready to emerge. These young bees are called Nurse Bees, because they take care of feeding the larva. Days 3-5 they feed the older larva and days 6-11 they feed the youngest larva. On day 10 bees develop wax producing glands on their abdomen. Researchers still don't know exactly how it works, but I think it is a little like ear wax. At this age the bees are eating lots of honey to convert to wax. For every 6 pounds of honey they eat (as a group), they produce 1 pound of wax. They use this wax to build the comb. The comb wax is cream colored when it is new or freshly built. During days 10-16, bees are best at producing wax as they get older they produce less wax. So during days 12-17 they are making wax and building comb. They also carry food to store in the cells and perform undertaker duties. An undertaker is someone who takes care of the dead. As a bee they take any dead bees out of the hive. During this time, a bees stinger is at maximum potency. That means it has some really strong venom. Since they have the strongest stingers they work as guard bees. A guard bee inspects every bee that enters the hive. They can smell the bee and tell if they are from this hive or another. If a bee from another hive comes to the door with pollen or nectar the guards won't stop them. It's like they are bringing gifts. If a honey bee from another hive comes with nothing the guards won't let them enter. If a wasp, bumble bee, or yellow jacket tries to enter the guard bees will not let them in either. They will release a pheromone or a smell to warn the others. It works a lot like a fire alarm warning people there may be a fire. Other bees will come out and attack. If they are trying to rob the hive, by stealing their honey, the bees will attack. This is when the worker bee begins to forage. They start searching and collecting water, pollen, and nectar. The single bee will travel to many different flowers of the same kind collecting pollen and nectar. They pollinate these flowers when pollen sticks to the hairs on their body and then rubs off onto another flower. 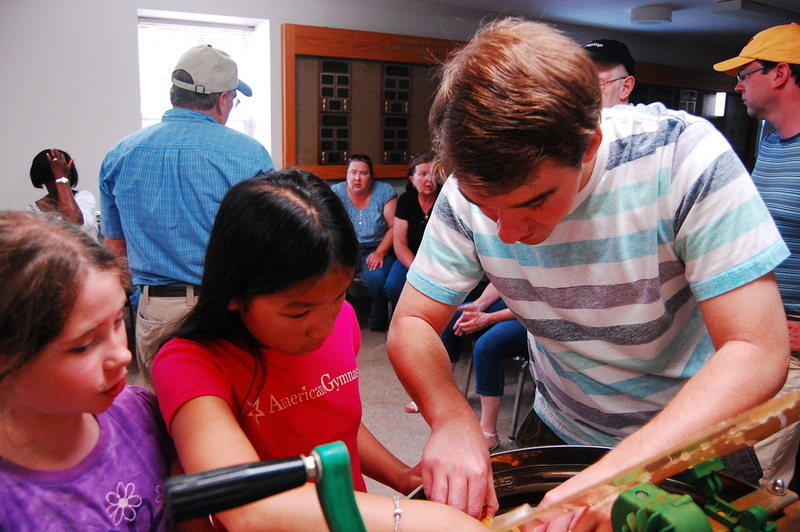 The other day, My classmates and I were invited to see how honey is harvested. 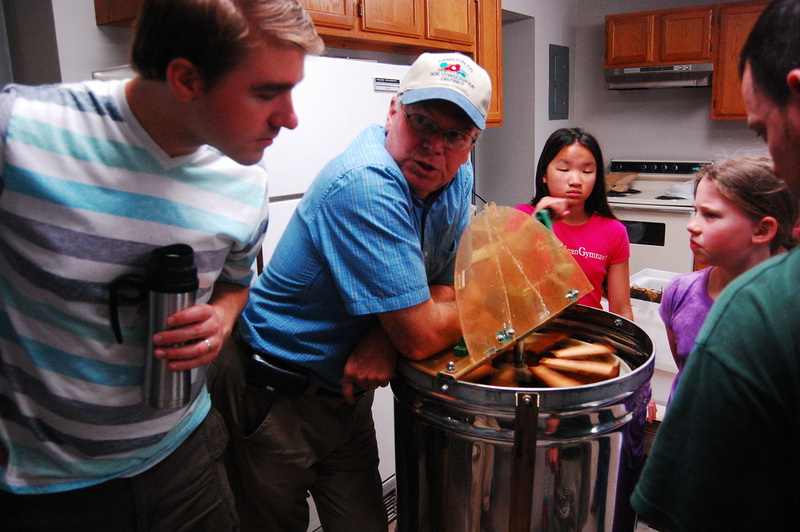 Another mentor, Bob, had some neat tools to help get the honey out of the hive. Here is a look at the process of harvesting honey. You can click on the small photos to make them larger. Bob is the man in the blue shirt. Bob, knew what to expect so he put a large tarp down so that we wouldn't make such a sticky mess. Here are some photos of the tools we used. We had a large plastic tub with a grate in it to uncap the honey. All of the cappings would fall into the tub and any honey would fall through the grate. 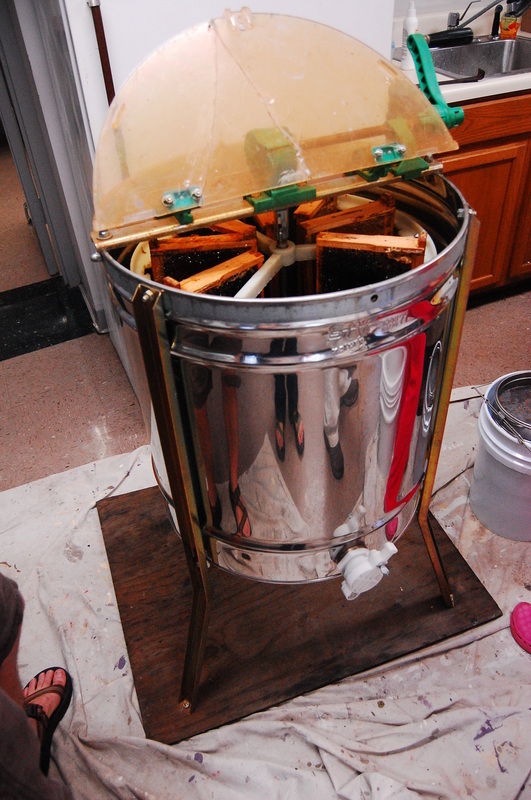 After uncapping honey we could put the frame in the buckets or use an extractor to get the honey out. The buckets have a nylon strainer so that only honey will pass through it. 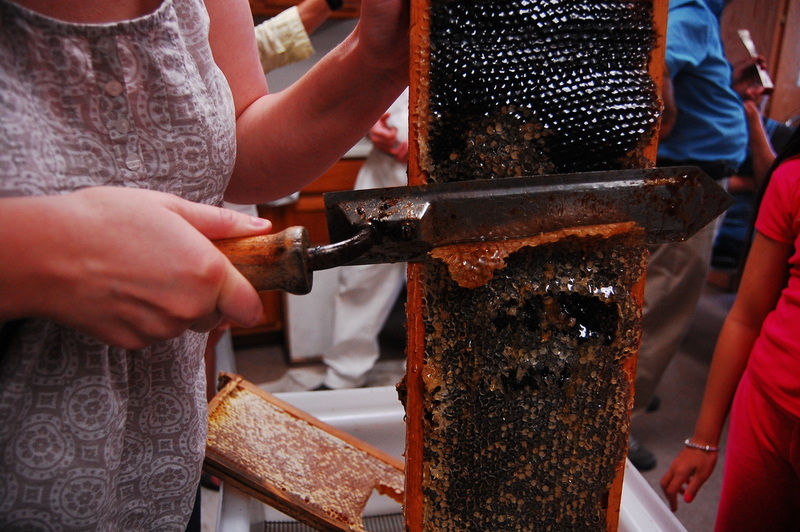 The first part of honey harvest is bringing in the frames that are capped and filled with honey. To avoid bringing the bees in with the super box, you can brush them off with your bee brush, use a smelly fume board, or even use a leaf blower. If you are gentle, you can use any of these methods to get the bees out of the supers. Once you have your frames of honey, you will uncap the honey. When bees make honey the right consistency (not too watery) they will put a wax cap on it to preserve the honey. We used a hot knife to slice off the caps. It actually melted the wax so it was really easy to slice through the wax caps., but If that doesn't uncap all the honey comb, then you can use a capping scratcher or a fork to open the rest of the comb caps. As, you can see in the photo's the knife doesn't really look sharp, but it was hot. The scratcher is the teal tool in the middle. Now for the really fun part. After taking the caps off you put the frames into an extractor. 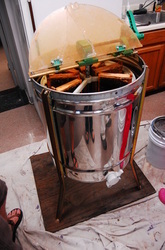 The extractor will spin the honey out of the frame. If you took a wet towel and spun it around as fast as you could some of the water would fling out of the towel. The extractor works the same way. While you spin out the honey you can see it fling up against the walls of the machine. It oozes down and then comes out the bottom. Then you have honey. We strained it as it dripped into the bucket and then we had a taste test. Lots of sticky goodness. Staring at the dancing bees in an observation hive, it hits me. I love how these tiny creatures communicate. It looks like they're having fun dancing around while telling their sisters where to find some nectar. I created this site to share what I know about these amazing creatures such a tiny creature has such a complex way to carrying out its purpose. And it all looks so simple. 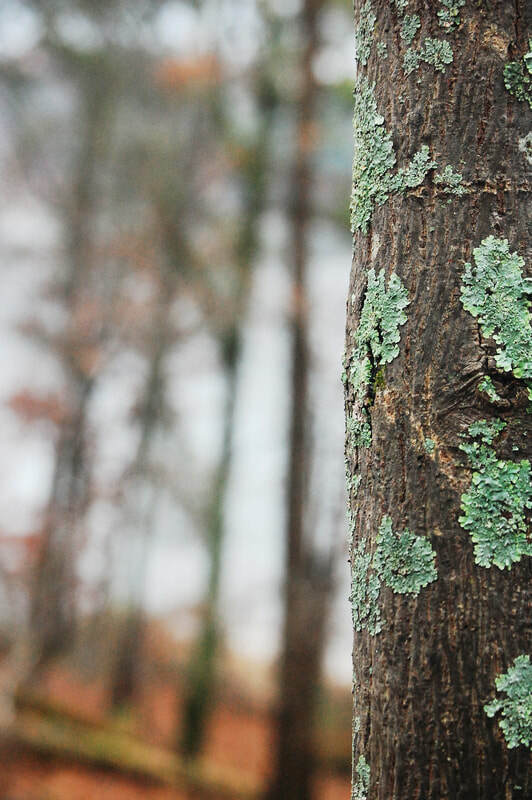 It reminds me that God takes care of the smallest details as his creation dances. So here goes. Join me on an adventure with bees. I hope we can make learning as fun as the dancing bees informing their sisters of sweet nectar.